Lift Tables reduce employee injuries by positioning work at a comfortable and ergonomic height to eliminate unnecessary bending, lifting, and other repetitive motions. The Powered Mobile Lift Table (PMLT) effortlessly repositions work with the press of a button. Its two swivel-with-brake and two rigid casters allows this labor-saving machine to travel anywhere it’s needed. BHS equipped the PMLT with durability features to ensure a long life. Its heavy-duty construction and powder-coat finish help it withstand harsh warehouse environments. 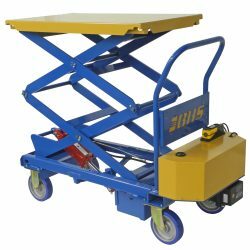 An enclosed and protected battery compartment and closed hydraulic circuits ensure years of flawless performance from these mobile lift tables. Increase productivity while preventing unnecessary strain with the PMLT. Whether the job is pallet loading, product assembly, or order picking, working at an ergonomic height will increase productivity while reducing worker fatigue and strain. Call +1 314 423 2075 to learn more about Powered Mobile Lift Tables. Our sales team can answer any questions you may have or direct you to a local dealer. As with all BHS products, our sales team is happy to discuss customizations to help our products more directly address your operation’s needs. Call now and find out how BHS products can help your warehouse improve safety and efficiency.